My mom had two separate stem cell transplants in an attempt to put her multiple myeloma at bay. This involved dropping her immune system down to nothing and spending many days in a small wing of a hospital. There was still a feeling of hope during this time. And then that day in October came when she entered the hospital and didn’t leave. I spent many hours writing out all of the text messages between her and I from January to October. Those back and forths seemed like nothing at the time…just banter about daily life, those moments in-between life’s big events. 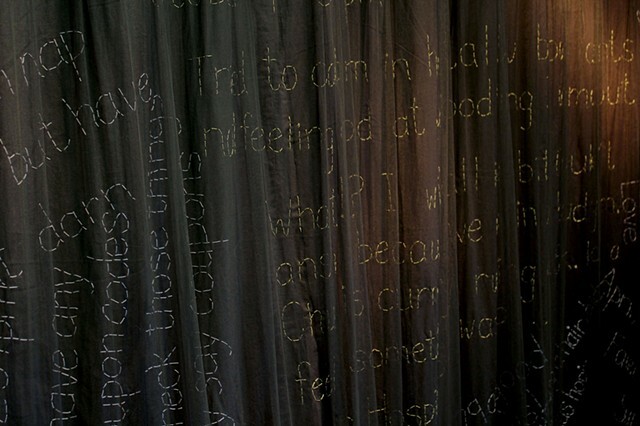 The In-Between displays some of those texts stitched on a hospital like curtain. Our texts are now a journal for me- a reminder of what we were doing during our last nine months together.